Hypertension, White Coat; Masked Hypertension; Blood Pressure Monitoring, Ambulatory; Oman. Objectives: Our study aimed to estimate the rate of white coat hypertension (WCH) and effect, and masked hypertension in patients attending a tertiary care hospital for 24 hour ambulatory blood pressure monitoring (24-h ABPM). Methods: A total of 231 adult patients were referred to the Department of Clinical Physiology at Sultan Qaboos University Hospital, Muscat, for ABPM, between January 2010 and June 2012. The following data were gathered and analyzed: demographic data, clinic blood pressure (BP) measurements, and 24-h BP profile from ABPM. Thirty-two patients were excluded and the final analysis included 199 patients. Results: There were 105 (52.8%) women and 94 (47.2%) men studied. The mean age of patients was 46±15 years and most patients were overweight with a mean BMI of 29.6±5kg/m2. Around half of patients (53.8%) were on one or more antihypertensive medications. WCH was found in 10.6% and white coat effect was found in 16% of patients. The majority of patients (57%) with WCH were aged 40 years or above. Masked hypertension was present in 6% of patients and masked uncontrolled hypertension in 8.5% of patients. Conclusions: Our study showed that WCH and effect, and masked hypertension are common in hypertensive patients. Identifying these patients will have an impact on their management. However, the results of the study should be interpreted within the context of its limitations. Prospective randomized community and hospital-based studies should be conducted to estimate the true prevalence in the general population as well as in hypertensive patients. Identification of the white coat effect (WCE), on the other hand, occurs when the office BP is markedly higher than the awake ABPM6 and it includes untreated and treated hypertensive patients. However, to be clinically important, it was suggested that the office systolic or diastolic BP should be 20mmHg or 10mmHg greater than the awake ABPM, respectively.6 WCE is a recognizable cause of false resistant hypertension and is often a misleading cause for the severity of hypertension leading to the prescription of unnecessary medications. To the best of our knowledge, there was no study that evaluated WCH and/or WCE, or masked hypertension in the treated or untreated Omani population. Therefore, our study aimed to estimate the magnitude of the WCH/WCE and masked hypertension in patients attending Sultan Qaboos University Hospital (SQUH) for 24-hour ambulatory blood pressure monitoring (24-h ABPM). This retrospective study included patients attending the Department of Clinical Physiology at SQUH between January 2010 and June 2012 who were referred for 24-h ABPM. All ABPM recordings of adult subjects over 18 years old during this period were reviewed and analyzed. The ABPM recording was performed using the auscultatory mode of the validated Schiller BR-102 plus (Schiller AG, Switzerland). The ABPM monitor cuff was wrapped around the patient’s non-dominant arm between 8:00 and 12:00 hours for a period of 24 hours. It was set automatically to measure and record blood pressure every 30 minutes during the active/awake period and every 60 minutes during the sleep/rest period. During the waking period all patients recorded their activities in a dairy. Only ABPM that had at least one reading every hour during the active and resting period were included in the study. The hospital information system was used to obtain the demographic and clinical data as well as the office BP readings. The office BP measurements were carried out by a dedicated nurse using a calibrated, automated BP machine (Datascope Trio, China) after five minutes of rest in a sitting position. The average awake/daytime BP readings in the ABPM were used to identify patients with WCH, WCE, or masked hypertension as follows: untreated subjects with elevated office BP (≥140mmHg systolic and/or ≥90mmHg diastolic) with a normal BP (<135mmHg systolic and <85mmHg diastolic) in the daytime on ABPM were considered to have WCH. Treated patients with an office systolic or diastolic BP 20mmHg or 10mmHg greater than the mean daytime readings on ABPM were considered to have WCE. Masked hypertension and masked uncontrolled hypertension were diagnosed in the presence of a normal office BP of <140/90mmHg with elevated daytime BP of ≥135/85mmHg on ABPM in untreated and treated patents, respectively. Our study was approved by the Medical Research Ethics Committee of the College of Medicine and Health Sciences, Sultan Qaboos University, and conducted according to principles of the Helsinki Declaration. Statistical analyses were performed using SPSS, version 19. Descriptive statistics were used to describe subjects’ data. For categorical variables, frequencies and percentages were reported. For continuous variables, mean and standard deviation (SD) were presented. A total of 231 ABPM reports were analyzed. Thirty-two reports were excluded because 25 subjects had an invalid number of BP readings and seven subjects were below the age of 18. A total of 199 reports were included in the analysis. There were 105 (52.8%) women and 94 (47.2%) men. Around half of the patients (53.8%) were on one or more antihypertensive medications. Table 1 summarizes the demographic and clinical characteristics of the patients. The mean age was 46±15 years and most of the patients were overweight with mean BMI of 29.6±5kg/m2. Table 2 shows the distribution of patients according to BP differences (office vs. active/daytime ABPM). Thirty-four percent of patients had normal BP readings and 24% had high BP readings both in the office and using ABPM in treated and untreated patients. Table 1: Demographic and blood pressure values of patients (n=199). SBP=systolic blood pressure; DBP=diastolic blood pressure. Table 2: Distribution of subjects according to blood pressure difference (office vs. average active/daytime ambulatory blood pressure monitoring). WCH= white coat hypertension; WCE=white coat effect. WCH was found in 10.6% of patients and WCE in 16% of patients. 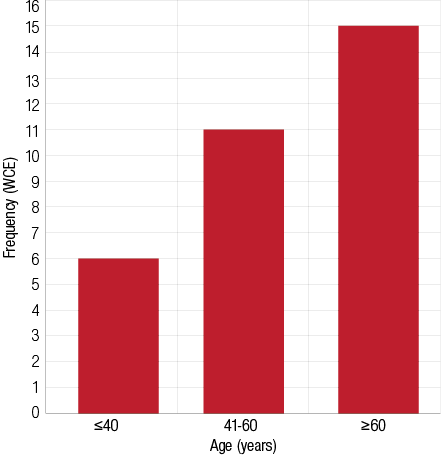 The majority of patients (57%) with WCH were aged 40 years or above [Figure 1]. In contrast, WCE was more common in patients aged 60 years or more [Figure 2]. Patients with masked hypertension were 6% and those with masked uncontrolled hypertension were 8.5%. Figure 1: Distribution of subjects with white coat hypertension (WCH) according to age. The majority (57%) of subjects were aged ≤40 years. 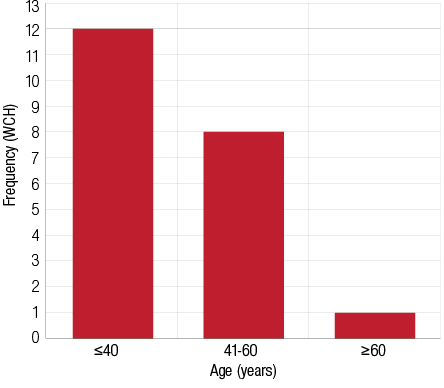 Figure 2: Distribution of patients with white coat effect (WCE) according to age, 47% of subjects were aged ≥60 years. This study was proposed to evaluate the magnitude of WCH, WCE and masked/masked uncontrolled hypertension in patients referred for ABPM. It showed that 26.6% of those patients had WCH/WCE and 14.5% had masked/masked uncontrolled hypertension. White coat phenomenon, which includes WCH and WCE, is not uncommon in clinical practice.9 Identifying such conditions is critical to avoid subjecting individuals to lifelong unnecessary antihypertensive medications and to have appropriate plans for patients requiring follow-up. Although there is no convincing evidence for pharmacological treatment for WCH, several studies showed that patients with WCH are at higher risk of developing sustained hypertension and to be associated with target organ damage.12 It was also shown that WCH carries a higher risk for cardiovascular mortality than prehypertension.14 Patients referred for ABPM to the Department of Clinical Physiology, SQUH, came from primary care clinics as well as specialized hypertension, cardiology, endocrinology, and nephrology clinics. Therefore, the subjects included in our study provided a good representation of the hypertensive population. Our study showed that 10% of subjects had WCH with an office BP of ≥140/90mmHg and an active/awake BP in ABPM of <135/85mmHg. The majority of patients were aged 40 years or less. In a previous study by Farhan et al,15 suspected WCH was an indication for a request of APBM in 10.6% of referred patients. However, the aim of their study was to evaluate the use of ABPM in risk assessment and management of hypertensive patients, and there was no intention to identify the magnitude of WCH. In contrast to other studies, in our study WCE was more common in older patients. However, as the sample size in our groups was small our results should be interpreted with caution. White coat hypertension/effect is common in clinical practice. Identifying patients with this condition would prevent subjecting them to unnecessary lifelong medications with potential side effects. It would detect patients with pseudo-resistant hypertension and, therefore, reduce extra drugs and investigations. On the other hand, detecting patients with masked hypertension/masked uncontrolled hypertension would protect them from cardiovascular events that may result due to the lack of optimal BP control. This study reports the extent of these conditions and highlights their importance. However, the results of this study should be interpreted within the context of its limitations. Prospective randomized community and hospital-based studies should be conducted to estimate the true prevalence in the general population as well as in hypertensive patients. Lim SS, Vos T, Flaxman AD, Danaei G, Shibuya K, Adair-Rohani H, et al. A comparative risk assessment of burden of disease and injury attributable to 67 risk factors and risk factor clusters in 21 regions, 1990-2010: a systematic analysis for the Global Burden of Disease Study 2010. Lancet 2012 Dec;380(9859):2224-2260. Lawes CM, Vander Hoorn S, Rodgers A; International Society of Hypertension. Global burden of blood-pressure-related disease, 2001. Lancet 2008 May;371(9623):1513-1518. Falaschetti E, Mindell J, Knott C, Poulter N. Hypertension management in England: a serial cross-sectional study from 1994 to 2011. Lancet 2014 May;383(9932):1912-1919. Mancia G, Fagard R, Narkiewicz K, Redón J, Zanchetti A, Böhm M, et al. 2013 ESH/ESC Guidelines for the management of arterial hypertension: the Task Force for the management of arterial hypertension of the European Society of Hypertension (ESH) and of the European Society of Cadiology (ESC). J Hypertens 2013;31(7):1281-1357. Parati G, Stergiou G, O’Brien E, Asmar R, Beilin L, Bilo G, et al; European Society of Hypertension Working Group on Blood Pressure Monitoring and Cardiovascular Variability. European Society of Hypertension practice guidelines for ambulatory blood pressure monitoring. J Hypertens 2014 Jul;32(7):1359-1366. O’Brien E, Parati G, Stergiou G. Ambulatory blood pressure measurement: what is the international consensus? Hypertension 2013 Dec;62(6):988-994. Jennings GL, Touyz RM. Hypertension guidelines: more challenges highlighted by Europe. Hypertension 2013 Oct;62(4):660-665. Krause T, Lovibond K, Caulfield M, McCormack T, Williams B; Guideline Development Group. Management of hypertension: summary of NICE guidance. BMJ 2011;343:d4891. Franklin SS, Wilkinson IB, McEniery CM. Unusual hypertensive phenotypes: what is their significance? Hypertension 2012 Feb;59(2):173-178. Franklin SS, Thijs L, Hansen TW, O’Brien E, Staessen JA. White-coat hypertension: new insights from recent studies. Hypertension 2013 Dec;62(6):982-987. Viera AJ, Shimbo D. Ambulatory blood pressure phenotypes and the risk for hypertension. Curr Hypertens Rep 2014 Oct;16(10):481-485. Peacock J, Diaz KM, Viera AJ, Schwartz JE, Shimbo D. Unmasking masked hypertension: prevalence, clinical implications, diagnosis, correlates and future directions. J Hum Hypertens 2014 Sep;28(9):521-528. Banegas JR, Ruilope LM, de la Sierra A, de la Cruz JJ, Gorostidi M, Segura J, et al. High prevalence of masked uncontrolled hypertension in people with treated hypertension. Eur Heart J 2014 Dec;35(46):3304-3312. Sung SH, Cheng HM, Wang KL, Yu WC, Chuang SY, Ting CT, et al. White coat hypertension is more risky than prehypertension: important role of arterial wave reflections. Hypertension 2013 Jun;61(6):1346-1353. Farhan H, Al-Hasani M, Misbah M, Sallam M. Comparative study of ambulatory blood pressure monitoring and clinic blood pressure measurement in the risk assessment and management of hypertension. Sultan Qaboos Univ Med J 2010 Dec;10(3):370-376. Verberk WJ, Kessels AG, de Leeuw PW. Prevalence, causes, and consequences of masked hypertension: a meta-analysis. Am J Hypertens 2008 Sep;21(9):969-975. Baguet JP, Lévy P, Barone-Rochette G, Tamisier R, Pierre H, Peeters M, et al. Masked hypertension in obstructive sleep apnea syndrome. J Hypertens 2008 May;26(5):885-892.